Welcome to Four Seasons Air Specialists! We are proud to be the designated Dave Lennox Premier Dealer™ in White Bear Lake, Minnesota. This designation allows us to offer the finest heating, cooling and indoor air quality products in the area. You can count on us to deliver prompt and professional customer service, as we are monitored every month by a third party company on the service we provide our customers. 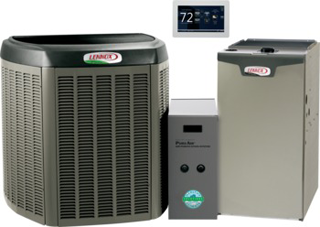 We will ensure that your home or business has the right HVAC system to keep it at your desired comfort levels, regardless of the season or the temperature outside. Four Seasons Air Specialists has served residents of the White Bear Lake area with the best heating, cooling, and indoor air quality products and services since 1974. We have an excellent reputation for possessing the experience and knowledge to deliver the best HVAC solutions to our customers. Our technicians are trained and certified to service and install your heating, cooling and indoor air quality systems. Please explore our website to learn more about our quality products and services. When you are in need of any new heating, cooling, or indoor air quality products or services, please call Four Seasons Air Specialists. We will ensure you receive a fantastic customer experience and will provide the best products to meet your budget.